This page is where approved fosters can learn more about what dogs (and cats) currently need a foster or fospice home. We rank dogs as follows: 1 indicates a dog that is easy, or good for a beginner; 2 indicates a dog with moderate health needs that can be easily managed with a little extra work; 3 indicates a special needs (medical or behavioral) dog requiring an experienced and/or dedicated foster home. We encouraged qualified fosters to help rank 3 dogs first, as they are the ones least likely to find a foster home, and then rank 2. Angel and Duke were surrendered by their owners when they moved to no-pet housing. Both are very sweet, very cute (both their tongues hang out). They are house-trained, crate trained, enjoy toys and short walks, and do well with both dogs and cats. They can be cat tested by request. Breezy is a sweet old girl who was surrendered by her owner when they moved. She just arrived at the shelter on 11/20, but she needs to be transferred immediately. She has a history of seizures, the last of which was several years ago and was likely due to unregulated blood glucose. Several people at CKSDR will be available to her foster for diabetes support- it is a very easy condition to manage, though it can be intimidating initially! She is good with dogs, cats, and kids. Buddy Bear is an adorable little old man who was surrendered due to his medical needs. He is about 4 lbs, with painful arthritis in his back legs. He should not be allowed to jump up/down on furniture, stairs, etc. He has to pee frequently, but might be able to use either belly bands or pee pads. He is good with dogs, cats, and older, gentle children. Gomez Addams is pretty much the BEST CAT EVER. He is amazingly sweet, very outgoing, and loves everyone- he gives tongue-baths to his people, other cats, dogs, kids, and even a rat that he met (probably not a good mouser). He is completely toothless due to severe dental disease that was treated when he first arrived, but he still loves his food. He is great on a harness. FIV is not easily transmitted (it spreads through mating and deep bite wounds, and since Gomez is neutered and toothless, the risk is extremely low), but does compromise Gomez's immune system. All that means is that he's more vulnerable to becoming sick- but he's a super healthy boy thus far! Sadie is ridiculously sweet and super active! She would be a perfect hiking companion, or co-adventurer for an awesome family. She LOVES kids of all ages (even the tiny ones), and would do fine with another calm, older dog that would mostly ignore her. She can chase squirrels for 3 hours straight (so a backyard would be great) but then she's up for a long nap on the couch with you. Sadie loves people more than anything, and is the type of dog that looks at you with open adoration every time she sees you. 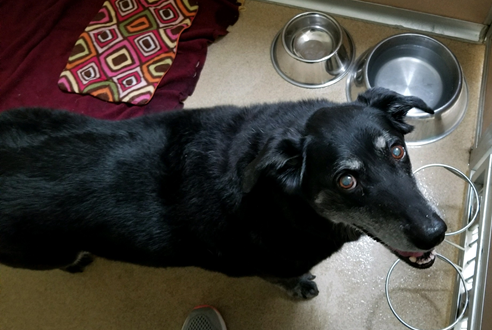 We don't know how long Sadie has before her cancer returns, but she needs a family to make every day until then a great day. Tinkerbell came to us as a cruelty case from Boulder Animal Control. 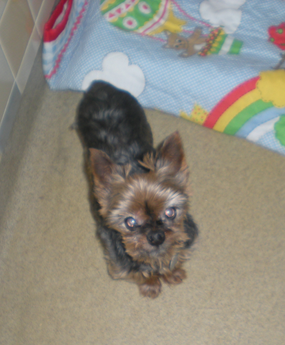 Though she appears completely blind, she does have some sight and can hear fairly well. She does wonderfully with other dogs and cats. She truly needs someone who can be patient with her, give her lots of TLC to bring her out of her shell, and help Tinkerbell learn to trust people again. 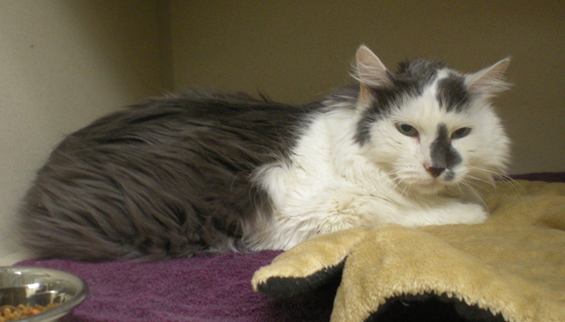 Tony was surrendered due to his medical needs- which at the time was undiagnosed diabetes. He lived in a very busy home with several other dogs, cats, and children- all of which he loved and cuddled with. There are several CKSDR fosters who can help with diabetes support and management, and it's a very easy condition to manage, though often intimidating initially. He also has extra toes for extra adorableness!